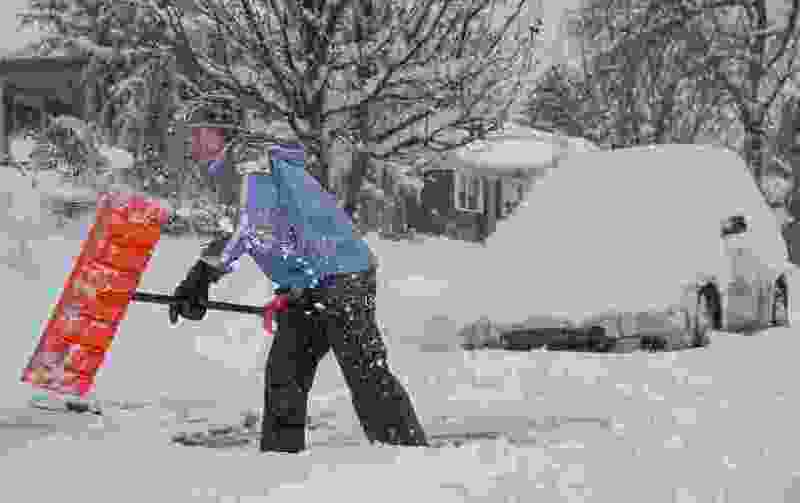 (Francisco Kjolseth | The Salt Lake Tribune) Barbara Bean clears the way to get her car out of the driveway as Salt Lake residents dig out following a heavy snow storm on Wed. Feb. 6, 2019. Another cold front is going to bring snow to Utah on Saturday night through Sunday, but unlike the winter storm early last week, forecasters say Utahns can measure the total accumulation in inches instead of feet. The National Weather Service is predicting at least 1 inch of snow throughout most of the state, with valley towns along the Wasatch Front seeing approximately 2 to 6 inches of snow by Sunday evening. They predict 6 to 10 inches of snow in the mountains. Park City is predicted to get 6 to 8 inches. By Sunday evening, forecasters expect snow to accumulate rapidly along the Interstate 15 corridor, hindering traffic through the Monday morning commute. The fast moving and weak storm is expected to begin Saturday night, bringing with it icy driving conditions in the upper canyon and mountain pass areas in the northern and central mountains. The worst snow conditions should hit northern Utah between 2 and 7 p.m., and move into central Utah between 4 and 10 p.m. Southern Utah will feel the worst impacts between 7 p.m. Sunday and 1 a.m. Monday. A winter weather advisory associated with the storm will be in place for much of the northern, central and western parts of the state through 4 a.m. Monday. According to the United States Drought Monitor, all of Utah remains in drought conditions, ranging from abnormally dry to extreme drought, with much of the state in a moderate drought. However, over the past three months, data shows improved conditions. With all the recent precipitation, National Weather Service hydrologist Brian McInerney said in a Feb. 7 water supply briefing, the question becomes: Is it enough to fill Utah’s reservoirs? If the weather continues as it has, and especially if the spring is cold and wet, McInerney said there’s a shot. “We still have a lot of winter to go, but it’s looking quite promising that our water supply picture is going to improve,” he said.